Website of the unbelievable Yoshi, and Tsuki too. It's time to update your links and bookmarks! At long last, we've finally got Yoshi & Tsuki's website redesigned and working properly! If you're still using the old URL (http://www.illovich.com/yoshi), please update your bookmarks and links. This site will still continue to work, at least until it's redirected, but it won't be updated with any new entries. We'll eventually figure out how to redirect the old site, but, for the moment, you'll need to use one of the above URLs. Sorry for the lack of updates. We're all doing A-OK, I've just been working on some freelance web projects, so haven't had a lot of time to work on Yoshi & Tsuki's site. 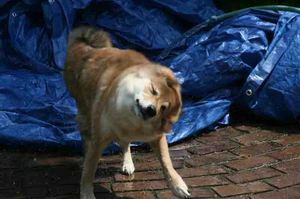 I guess I'm sort of falling down on the job over here. They've both still been up to their usual adventures and mischief, and I've taken a bajillion pictures of them over the last few months, so hopefully I'll have some time after August to sort through them and post the best ones. Tsuki celebrated her 4th birthday on May 2nd, and her gift was 4 new Teddy Possums! They are her absolute favorite toy (and Yoshi likes them, too), so she celebrated by de-squeaking and de-stuffing 2 of them. The other 2 are still in the cabinet waiting for a rainy day. Someday, I'll have to take pictures of the possum husks that are strewn all over our house. Eventually, the dogs wind up ripping them into several pieces, and then it really starts to seem like they're everywhere. But, enough about stuffed animals. Yesterday was a very momentous occasion. Tsuki killed her first REAL animal! 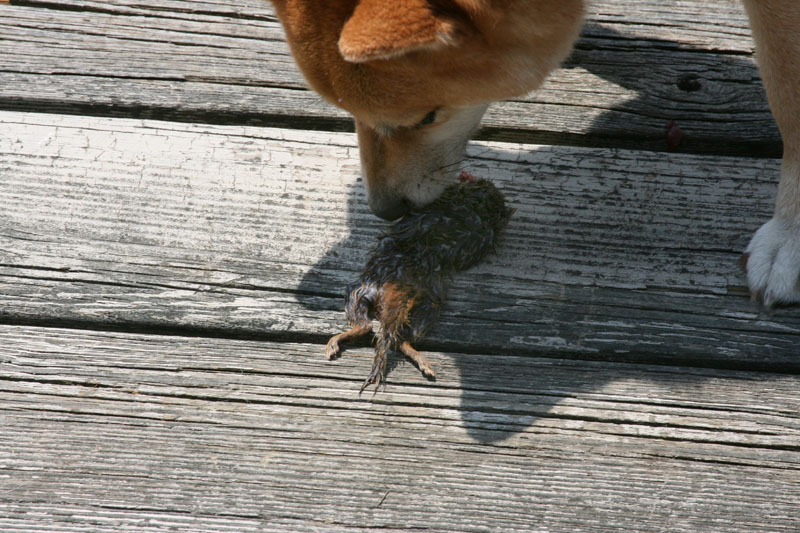 She and Yoshi worked as a team to catch it, but Tsuki was the one who sent the little chipmunk to the big oak tree in the sky. 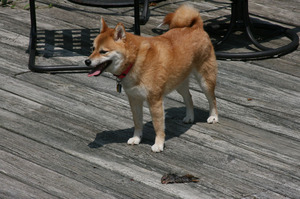 Here's the little predator with her prize chipmunk. She didn't really know what to do with it after she killed it. We figured she'd eat it, but she didn't. She was just super excited to have caught it, and seemed to take great joy in shaking the bejeezus out of it. 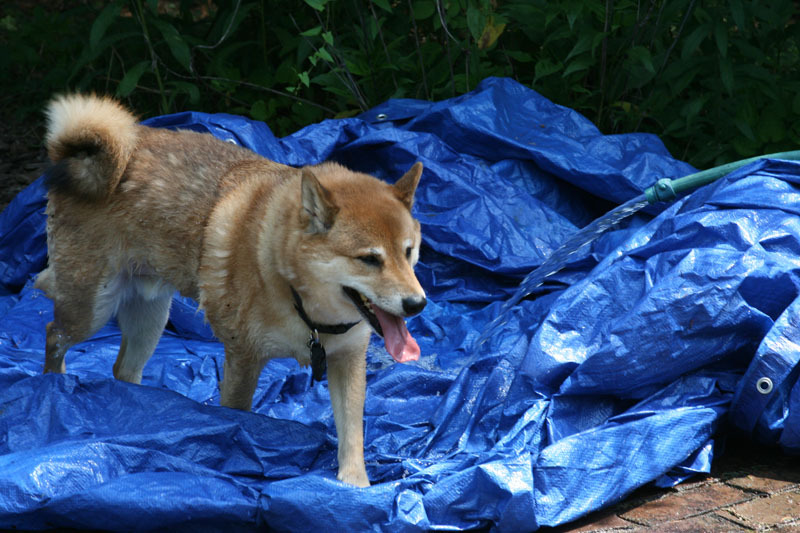 We felt bad for the little guy, and we tried to help him escape, but the sheebs were fast and determined. 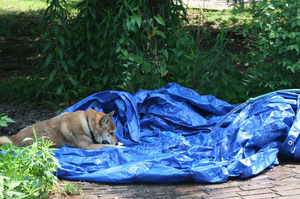 It was so hot yesterday that Yoshi insisted on laying on this tarp where stinky water and leaves had collected. There is a pool less than 10 feet away, but Yoshi is afraid of it, and it's probably not stinky enough for him. Popi came up with the genius idea to let the hose run over the tarp, which made it more fun, and less likely to result in Yoshi needing a B-A-T-H (or, our canine code word for it, hydrossage). Win-win! 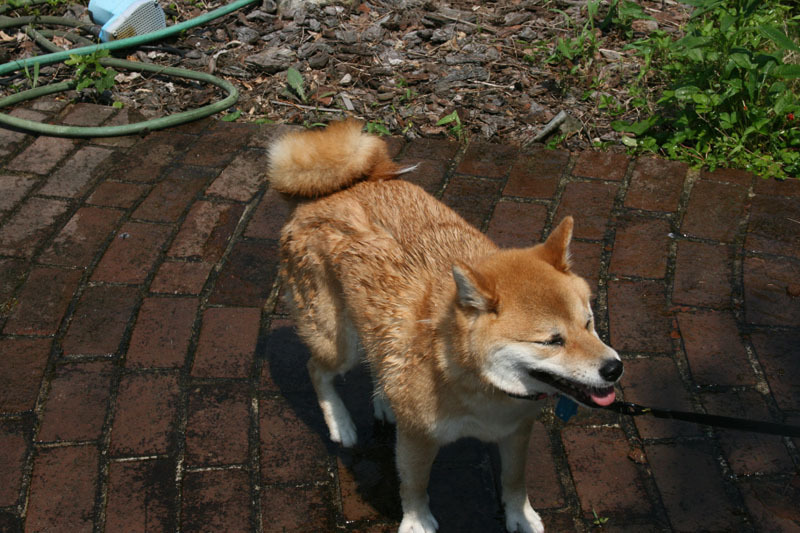 Yoshi pretty much thought he was the coolest dog ever. Shaking off was half the fun! 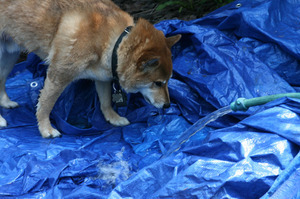 Tsuki wasn't thrilled with Yoshi's makeshift pool, but she enjoyed cooling off under the hose. I bet you didn't know that Yoshi & Tsuki have cat cousins! Actually, they have 4 cat cousins, but, in this entry, you'll meet Bart and Purrl (follow the link to see their brand new blog). Bart and Purrl live with Aunt Laura. The other cat cousins, Chester and Annabel, live with Aunt Stephanie. Bart is on the left, and Purrl is on the right. This year, we were afraid we were going to lose both of them, because they got very sick at exactly the same time. 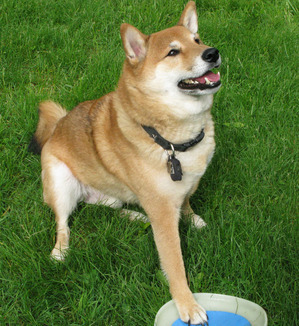 Within a few days of each other, Purrl developed inflammatory bowel disease, and Bart was diagnosed with kidney disease. Bartie is a stately old gentleman, but Purrlie is much younger, so it was really scary that they both got sick at exactly the same time. Their mom, Yoshi and Tsuki's Aunt Laura, was so sad and worried about them, and had to take them to about a billion vet appointments that first week. 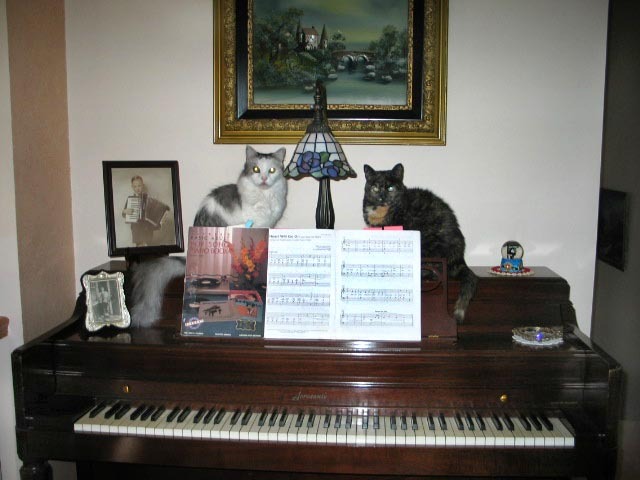 While they both like the piano, Bart is the more musically gifted. 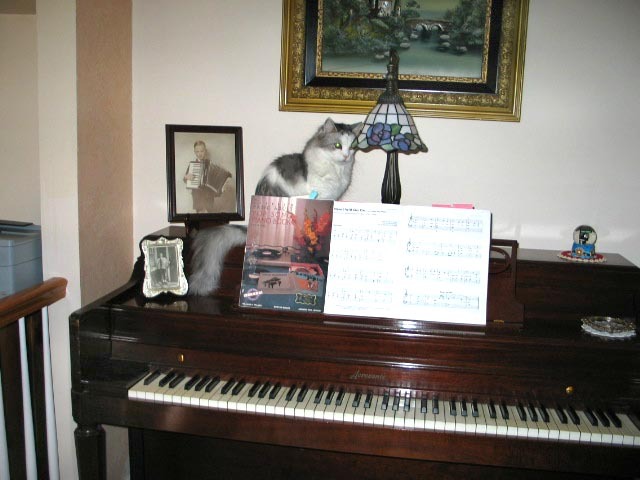 We think it may be because he used to hang around while Aunt Laura was having piano lessons. No one could figure out what was wrong with Purrl, but she couldn't keep food down. It took lots of tests to figure out what was happening. There was serious talk about euthanasia, but Aunt Laura wouldn't give up on her. Finally, Purrlie received the right diagnosis, got started on medication, and began her recovery. Thankfully, she's back to being a sweet, happy, comfortable little kitty. Bartie's diagnosis came as a real surprise, too. He was just at the vet for his yearly physical, and wasn't showing any signs of being sick, but his blood work revealed significant kidney disease. Since then, Aunt Laura has had to learn how to give him subcutaneous fluids, sort of like kitty dialysis, to keep him feeling good. He's lost a lot of weight, and has to be on medication and a special diet, but Aunt Laura is working hard to keep him strong and keep him with us for as long as she can. Bart is a really special cat. I know, I know, everyone thinks their cat is special, but Bartie really is a 1-in-a-million kitty. Bart likes to walk on a leash, ride in the car, go out to events and meet new people, heck, he'll even wear costumes if you want him to. Everyone who meets him falls in love with him, because he's affectionate and friendly, and is never timid with new people or new situations. He loves to talk (too much sometimes), and understands a lot of words. If Aunt Laura tells him to "give a kiss," he will mush his wet little nose into your face. He also insists on being blown with the hairdryer each morning (I swear, he's from another planet). If you'd like to send an e-mail to Bart and Purrl (or visit them on the web by clicking here), and maybe send Bartie some good wishes as he struggles with his lazy good-for-nothing kidneys, or let Aunt Laura know what a great job she's doing with them, I know it would mean a lot to all of them. You can click here to send them an e-mail. I don't have much info on this little girl, or even where she's located, but I'm guessing that she's near Philadelphia. I received this information from a colleague at work, so please contact Linda if you have questions. Cinnamon is 5 years old, spayed, and up-to-date on all shots. Cinnamon's owners are heartbroken to be looking for a new home for her, but their child is allergic. Cinnamon would do best as an only dog. Please email Linda if you, or someone you know, is interested in learning more about Cinnamon. 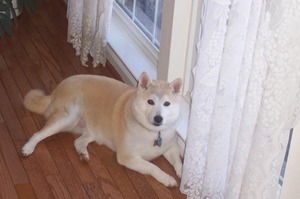 Also, please feel free to forward this information to anyone who you think might be interested in providing an excellent home for this shiba girl. Thanks to Blue, we now have the long version of the Father Travels SoftBank commercial, as well as the translation for the commercial and the accompanying song! Thank you, Blue! 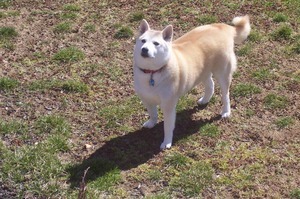 Father (Cream Shiba) is coming out of the small countryside station. Father is running up and down on stone steps of very narrow alleys. Father's voiceover: I'm sure I will come across Tada-Tomo that I have not seen yet. Father runs through a flock of pigeons. Father is sitting at the bus stop with a cute school girl. Father is walking in the rain. Father is getting on a boat. Father is looking down at the scenery from the window as the maid is serving tea. A woman who wears Yukata and Haori coat is walking in a courtyard. A woman, who turns out to be young and pretty, is making a call from the beach. Father gets a call and probably he thinks it is from that woman. Mother: Where are you roaming around? Father is walking by the Rotenburo. Father is coming out of the female section of the hot spring. Father: I made a mistake. Male voiceover: Free calling among family members for 24 hours. SoftBank.